Kraken Rising by Greig Beck is a very highly recommended action-packed military-adventure-terror-thriller, and it kept my total attention from the beginning to the end. We know several things from the opening chapters: a sub has been attacked by some huge, mysterious creature; Alex Hunter, the Arcadian, is still alive and working for the US military; an emergency beacon signal is being picked up by bases on Antarctica; and Chinese operatives have tried to capture Joshua, Alex's son and Aimee, his mother. This should tell all you action/adventure junkies that Kraken Rising will be an adrenaline-packed-thrill-ride of a novel. In 2008 a top secret US prototype submarine goes missing off the coast of Antarctica in the Southern Sandwich trench. The area is also known as the Southern Sea's Devil's Triangle. Thinking it was lost in a deep trench, the USA is surprised when the emergency locator beacon is discovered to now be sending a signal - a signal located deep underneath Antarctica. But the race is on because the Chinese, who have been illegally mining for precious minerals nearby have also heard the emergency beacon and are determined to claim the missing sub. Several different groups of soldiers with some scientists mixed in, are on the hunt and the situation is quickly turning political and the potential for an exchange of military fire is increasing exponentially. Alex Hunter, the Arcadian, is a super soldier. An experimental treatment after he was mortally wounded in a previous assignment has left him with super-human powers/skills, but he also has a dark side. Alex is sent in to find the sub on his own, but at the same time a team of HAWCs is also on the mission. Adding to the tension is the fact that Joshua's mother, petrobiologist Aimee Weir, is also on the mission since she has had previous experience dealing with the terrifying creature they must all now face. You really don't have to read any of the previous books to enjoy this one. I could swear I've read the first book in this series, the book which presents the first assignment in Antarctica, but although I kept remembering facts as I read this book, I couldn't find a review of it. Now it does resemble some other books set in the same geographical area with similar scenarios, so perhaps I was thinking of one of those books. Setting all that aside, I was totally engrossed in the story from beginning to end. Even though I think I read the first book, I know I haven't read any of the adventures in-between the first and this, the sixth, but still I had no trouble following the story. 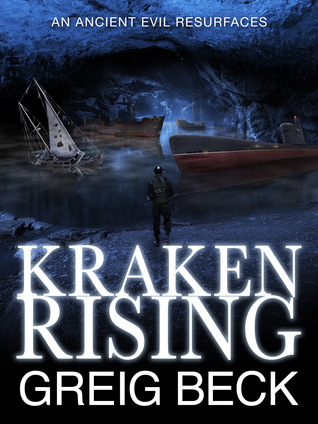 If you like skirmishes between super-human combatants and military novels with an element of sheer terror as both sides face the unknown as well as each other, Kraken Rising should make you happy. It's all about the action. I mean, come on, there's a kraken. This is a perfect stuck-over-night-at-the-airport book. Disclosure: My Kindle edition was courtesy of Pan Macmillian for review purposes.